Chinese New Year--start of the year on the Asian lunar calendar--in which February 19, 2015 is the first day of the first month of 4713, reminds me of places other than the People's Republic of China where the holidays of the lunar calendar are celebrated. Taiwan is a subtropical island off the coast of Asia. It has belonged to both China and Japan in the last 300 years and has an indigenous population that is neither Chinese or Japanese, so Taiwan is a very interesting blend of cultures. Currently they are a self-governed democracy. They industrialized early and are prosperous and high-tech. As an island, Taiwan is surrounded by beaches and beautiful ocean views. The temperatures are mild and the air warm and humid. 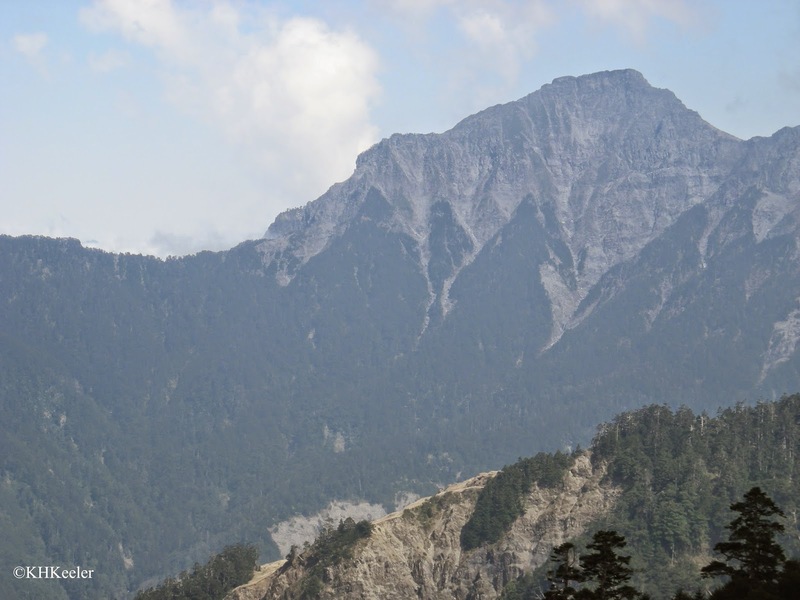 But down the center is a range of high mountains, so you can retreat up into the mountains for a change in temperature. In China, I toured the classical gardens of Suzhou. For generations, great respect was given to pensioners, especially former government officials, who build exquisite gardens where they wrote poetry and studied arts such as calligraphy. In Suzhou, you can visit several of the finest surviving traditional Chinese gardens. The Garden of the Master of Nets is probably my favorite, and it is regarded as among the very best. It is not very large. Land has been at a premium in China for hundreds of years. Part of the art of the traditional garden was to make a small area seem large and interesting. Corners and walls were arranged so that, seen from a different angle, the same spot looked quite different. Flowers in Colorado in January--Is it Spring? In northern Colorado, at 5000' elevation, the last week of January 2015, I found plants in bloom! We had daily highs above freezing, some days up into the 60's, some nights above freezing all night. In a search for "plant records" I have a quirky goal of finding plants flowering in every month of the year. So I went out looking for flowers on January 29. Some species do not need many days above freezing to launch their buds. And I found [drum roll]: Erodium cicutarium, redstem filaree! Also called redstem storksbill and common stork's bill (geranium family, Geraniaceae), it is from the Mediterranean region of Europe and was introduced to North America by the 1800s. It is now very widespread (every state but Florida and all the Canadian provinces that border on the U.S. (see USDA map)). But it is January, the depths of winter in the northern United States. How can plants be flowering? Global warming? Maybe. All over the world they are recording earlier and earlier warm temperatures. However, I want to think about how plants respond to unseasonable weather. This blog is two years old this week. I’ve written more than 100 posts. There are more than 300,000 plants, each with a story. There are even more places to visit. I am not going to run out of material. Researching and writing are great fun! What is often a challenge is having the right picture. If I didn’t take a photo of sunflowers during the summer, I don’t have it in the winter. Occasionally I use pictures taken by a friend but mostly this is a personal blog and if I don’t have pictures I postpone the topic. Being an amateur photographer not all my photos work out. I have a theory that there are “photogenic plants”—beautiful and recognizeable from any angle--in a continuum down to very unphotogenic plants--where it is hard to get a decent photo. Sloppy photos of roses come out nicely anyway. Often an unphotogenic plant has a shape that makes it hard to get both leaves and flower in focus, for example the chicory (Chicorium intybus) and sunbright (Phermeranthus parviflorus) below. 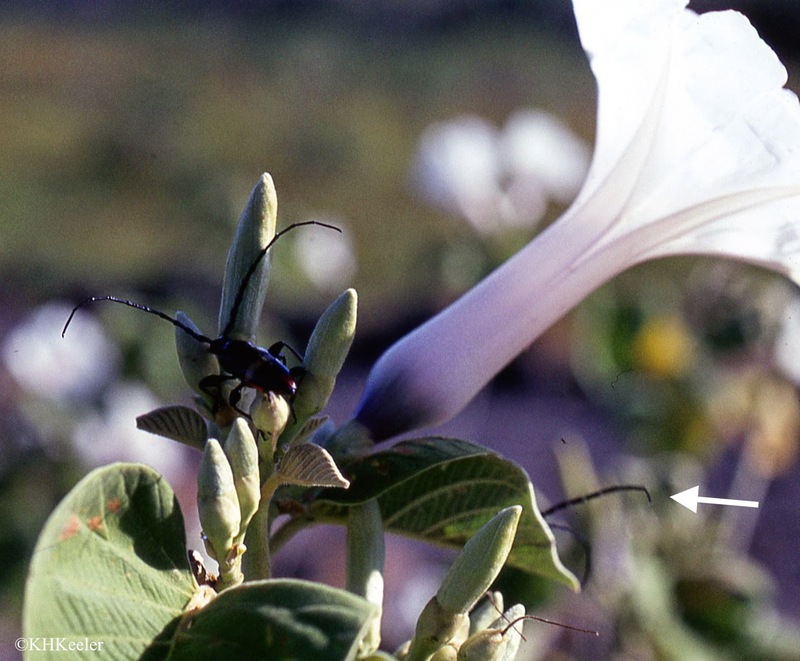 On sunbright, there are long thin stems, two to three times longer than the leaves, that hold small flowers up above the plant--you can see brown stems reaching out of the picture and flopping on the rock. A lot of pictures fail, if I take enough one will succeed. Photographs have not always been digital or visible while standing by the plant. I still regularly celebrate digital photos! In the Old Days, using film in my camera, I had only so many pictures (36, maybe 72 with a backup roll) and each photo cost more than a dollar between purchasing film and getting it developed, so taking a dozen pictures of the same flower was not an option for me. Furthermore, I didn't get to see the pictures until they were developed, a week or more later. Digital photos are wonderful! One of the joys of this blog is using my photos. 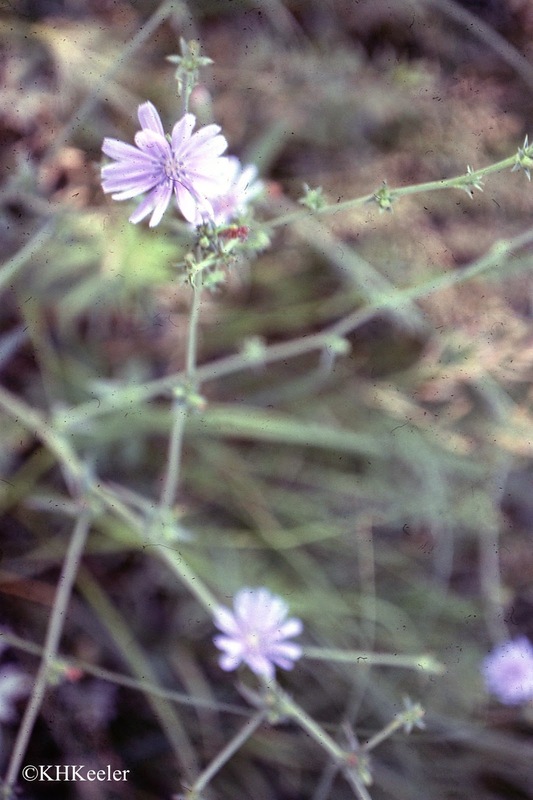 A few years ago I started scanning old plant pictures (like the chicory above) into my computer. I wondered why I was bothering. I was retired and had no use for diverse and esoteric plant pictures. That has turned around radically in the last two years. Now I search through the photo files and wish for more choices. And I am actively photographing all sorts of things I had been walking by: plants in the cracks in the pavement, house plants, pine cones. Sometimes I know how I'll use the image, sometimes I'm just building my photo-library. Looking at the pictures included in this post, I am reminded that all plant photography is strongly seasonal. Of the photos I included, none can be taken in Colorado in January, tho in western Costa Rica that morning glory is blooming. New leaves or flowers or fruit, or leafless trees for that matter, happen in a particular time of year. It can be 11 months before the same picture can be taken again. I don't object to that--it is an essential part of botany--but it certainly affects my posts. I have a prairie ecologist's maxim that goes: "Do it now, the weather may be worse later." There's a corollary that goes something like: "Notice the plants now, the season is changing." Thank you for reading this blog: I'm looking forward to Year Three. If you have questions, I’m happy to try to figure out the answers.